Aim: The purpose of this paper is to review the literature on the clinical effectiveness of contemporary resin-based dentin bonding agents primarily focussing on the longevity of restoration. Materials and Methods: The literature published from June 2004 up to September 2010 was reviewed for clinical trials that tested the effectiveness of dentin bonding agents in the longevity of noncarious class V restoration. Results of each study reported using the USPHS criteria for clinical assessment of restoration were included and tabulated. The American Dental Association guidelines for dentin and enamel adhesives were used as a reference to compare the performance of individual bonding agents. Kruskal-Wallis followed by Mann-Whitney U was done to compare the mean Alfa score percentage for the three categories of bonding systems [etch-and-rinse (ER), self-etch primer (SEP), and self-etch-adhesive (SEA)]. Results: A comparison of the mean Alfa score percentages revealed no difference between the ER, SEP, and SEA categories of bonding systems except for marginal adaptation where ER was found to be superior to SEA. Conclusion: The clinical effectiveness of resin-based bonding agents is comparable among the three categories. First is by removing the smear layer (etch-and-rinse (ER) technique) using 30-40% phosphoric acid. Etch-and-rinse system bonding mechanism to dentin is diffusion-based and depends on hybridization of the resin within the exposed collagen mesh as well as into the dentin tubules,  creating a micromechanical interlocking of resin within the exposed collagen fibril scaffold. Simplified two-step ER adhesives combine the primer and the adhesive into one application (often referred to as "one-bottle" adhesives). A distinction should be made between "mild" and "strong" SEA. "Strong" SEA have a rather low pH (<1) and have been documented with a bonding mechanism and interfacial ultra-morphology resembling that produced by ER adhesives. Consequently, the underlying bonding mechanism of "strong" SEA is primarily diffusion-based, similar to the ER approach. "Mild" SEA (pH ± 2) only partially dissolves the dentin surface, so that a substantial amount of hydroxyapatite remains available within a submicron hybrid layer. On the basis of the steps of application they can be categorized as: a two-step "self-etch primers" (SEP) and a one-step "self-etch adhesives" (SEA). Although the laboratory testing of contemporary adhesives bonded to sound the tooth substrate under optimal laboratory conditions has been shown to predict clinical effectiveness, , the ultimate test method to assess bonding effectiveness remains a clinical trial. Peumans et al.,  in a systematic review, emphasised the need to standardize the conduct and reporting of clinical trials on bonding agents to enable interpretation of the best current evidence. Following are the criteria for conducting, evaluating, and reporting clinical trials undertaken to study the effectiveness of bonding agents: (1) Noncarious cervical lesions (NCCL), (2) Modified United States Public Health Services (USPHS) criteria, and (3) Consolidated Standards of Reporting Trials (CONSORT) statements. Noncarious loss of dental hard tissue at the cervical region is used as a clinical model to evaluate the efficacy of dentin bonding agents in nonretentive tooth restorations, as recommended by the ADA. The characteristics of NCCL are:  (1) cervical lesions do not provide any macromechanical retention; (2) they require for at least 50% bonding to dentin; (3) when restored, they result in an enamel as well as dentin margin; (4) they are widely available; (5) they are usually found in the anterior teeth or premolars with good access; (6) preparation and restoration of class-V lesions are minimal and relatively easy, reducing somewhat practitioner variability; (7) despite varying cavity configuration factors of class-V lesions, and thus resultant interfacial stress, the mechanical properties of the composite used are relatively unimportant; and (8) ineffective bonding commonly results in restoration loss, which is the most objective evaluation parameter. 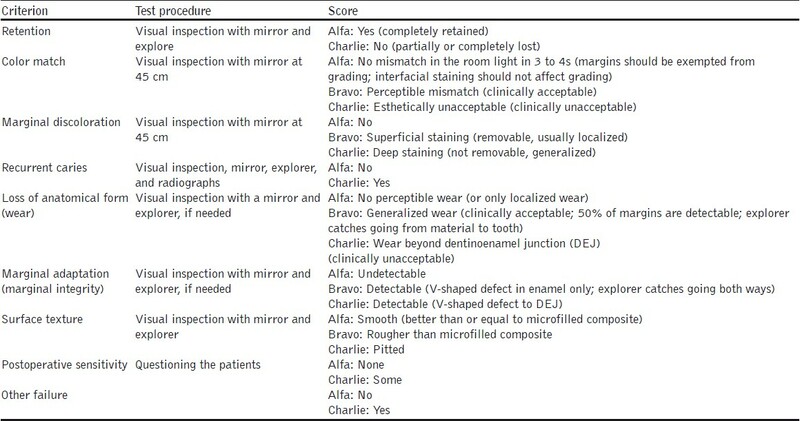 The modified USPHS/ Ryge criteria ,,, [Table 1] have been used widely for the clinical evaluation of restorations. Although these criteria do not consider critical issues such as the oral hygiene index and number of decayed, missing and filled teeth, they are the only criteria available for long-term evaluation of restorations. They are considered valid criteria for comparison purposes among studies at different observation periods. The limitation of this system as reported by Hayashi and Wilson  is an overlap from Alfa to Bravo ratings for certain characteristics, including marginal adaptation. These variations for some characteristics at various recall examinations need to be interpreted with caution. To facilitate the uniformity among examiners, Fukushima et al. emphasized the importance of interexaminer calibration/rating. This was initially formulated in 1996  and later revised in 2001. The CONSORT statement (or simply CONSORT) comprises a checklist of essential items that should be included in reports of RCTs and a diagram for documenting the flow of participants through a trial. It is aimed at first reports of two-group parallel designs. The objective of CONSORT is to facilitate the critical appraisal and interpretation of RCTs by providing guidance to authors about how to improve the reporting of their trials. Both laboratory and clinical studies , have shown that the GIC bonding mechanism is always superior to that achieved by adhesive resins. Hence this group of self adhering materials are not included for comparison in this review. The purpose of this paper was to review the current literature on the clinical effectiveness of resin-based adhesives when used to restore cervical noncarious class-V lesions. Peumans et al. published a systematic review on the same research question and the review included clinical trials published until May 2004. Hence the current search included studies published from June 2004 to September 2010. A PubMed search was conducted with the following key words: dentin bonding agents and noncarious cervical lesions. Specification of the time period in which articles were published, all articles published in English and clinical trials where the limits applied to refine the search. This yielded 366 articles on dentin bonding agents, 37 articles for noncarious cervical lesions, and 20 articles for combined search. Among the 366 articles on dentin bonding agents, 56 articles were short-listed after reading the titles (many included In vitro studies). After reviewing the abstracts of the 20 articles in the combined search and 56 articles on dentin bonding agents, 23 studies were included for the systematic review process. Clinical trials of which the data of successive recalls were reported in more than one paper were counted as separate studies. The Alfa score percentage reported for the bonding agents tested in each study was tabulated under three categories namely, etch-and-rinse (ER), self-etch primer (SEP), and self-etch-adhesive (SEA). Among the parameters of the modified USPHS criteria, marginal discolouration, marginal adaptation, retention, secondary caries, and postoperative sensitivity were considered to be a direct measure of the effectiveness of bonding agents and hence only these parameters were tabulated. Kruskal-Wallis followed by Mann-Whitney U was done to compare the mean Afla score percentage for the three categories of bonding agents (ER, SEP, and SEA) using SPSS 15.0 (SPSS Inc, Chicago, USA). The American Dental Association guidelines for dentin and enamel adhesives were used as a reference to compare the performance of individual bonding agents. In general, in the 5.3 years of literature review of PubMed indexed articles, only 23 clinical trials have been reported. A lack of study detail was noted in most of the articles. Long-term follow-up (>5 years) was reported in 8 of the 23 studies. The list of clinical studies with comments on the methodology is shown in [Table 2]. Six of the 23 studies reported involved the enamel bevel and mechanical preparation of the dentin walls was performed in 16 of the studies reported. Only 5 of the reported studies have mentioned the sample size calculation. The Alfa score percentages reported in various studies is shown in [Table 3]. The mean Alfa score percentages for the different criteria of bonding agents are given in [Table 4]. There was no significant difference for retention, marginal discoloration, postoperative sensitivity, and secondary caries among the three categories [Figure 1]. However, there was a significant difference for a marginal adaptation between ER category and SEA category (P<0.05). The adhesives tested in these studies are listed with the ADA full acceptance in [Table 5]. SEA were tested more frequently. Among the 17 ER bonding system studied in the reported trials, four bonding systems did not satisfy the ADA specification full acceptable criteria. All the four bonding systems (Scotchbond Multipurpose, One Step, Gluma 2000, and Denthesive) belonged to the two-step ER type. Among the 18 studies involving the two-step SEA (SEP, 6 agents) and one-step SEA (SEA, 12 agents), two (Denthesive 2 and Tyrian SPE), and three (Hybrid Bond, iBond Gluma inside, and PSA Dyract) bonding systems, respectively, did not satisfy ADA specification full acceptable criteria. In a systematic review, Heintze  found that the results of bond strength tests did not correlate with laboratory tests that evaluated the marginal seal of restorations such as microleakage or gap analysis. The quantitative marginal analysis of Class V fillings in the laboratory was unable to predict the performance of the same materials In vivo. The review suggested that microleakage tests or the quantitative marginal analysis should be abandoned and research should focus on laboratory tests that are validated with regard to their ability to satisfactorily predict the clinical performance of restorative materials. Peumans et al. reported the results of 32 clinical trials, and the current review on 23 trials is a clear indication of interest in understanding the clinical behaviour of adhesive materials. Certain level of uniformity while conducting clinical trials will allow comparisons of the results with other studies, thus enabling current best evidence. In some papers under the current review, the materials and methods were poorly described (insufficient information provided regarding patient selection and in-/exclusive criteria, recall rates, reasons of patient-drop out, inter-evaluator agreement, etc.). 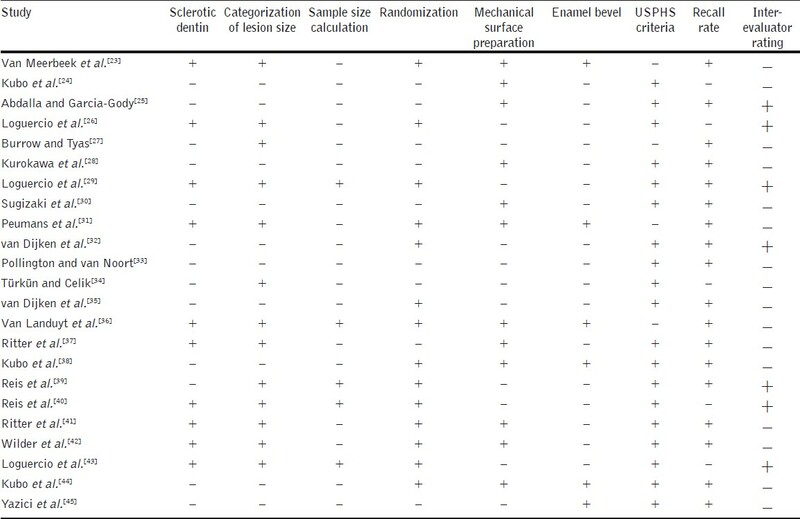 In addition, a large variety in study design (not uncommonly without a proper control or "gold standard", a "paired-tooth" design, adequate randomization, a sample size calculation, a sufficiently long follow-up), was noticed in these clinical trials, which makes it difficult to compare the overall clinical performance of adhesives. To increase the power of a class-V clinical trial, the study methodology must also be standardized better in the future. In many studies, patient-related factors, such as age, oral hygiene, occlusal loading and dentin sclerosis are more determining than any material property. , This patient factor can be ruled out by applying a balanced study design. In such a set-up, pairs of equal teeth (for instance, first and second premolar at the same side, left and corresponding right incisor, canine and premolar, respectively) with similar lesions are chosen in each patient and each tooth is assigned to one of the experimental treatments in a randomized manner. Also an adequate number of patients, rather than restorations, are paramount to extend the results from the statistical sample to the population; statistical power analysis can help to determine the number of patients required. In addition, recall periods must be standardized more, evaluation criteria must be assessed by calibrated independent examiners following a standard index system, and recall rates and reasons for patient drop-out must be reported as well. Retention, marginal integrity, and marginal discoloration (clinical microleakage) are usually the key parameter used to judge upon clinical effectiveness of adhesives and modified USPHS criteria allows such assessments. The use of uniform reporting criteria would enable comparison of clinical effectiveness. Although significant information was reported by some studies, ,, their retention rates could not be used for statistical analysis in the current review due to a different protocol to assess clinical effectiveness. Certain studies ,, which did not employ USPHS criteria could still be adapted to fit the criteria since the assessment criteria were similar. In a comprehensive systematic review of contemporary bonding agents,  it was concluded that the clinical effectiveness of two-step ER adhesives was greater than that of one-step SE adhesives. However, the current systematic review found the clinical performance of different categories of bonding agents was similar. Postoperative sensitivity and secondary caries were not seen to be a clinical problem with any category of bonding systems. This finding may probably due to the selection of NCCL. NCCL have higher degree of dentinal sclerosis thus offering protection from sensitivity. In general, all three categories of bonding systems had retention rates of 88.61-98.29%. The clinical performance of SEA was satisfactory in all criteria except for marginal adaptation showing inferior results compared to ER category, however comparable to SEP. The reason for this could be attributed to one study involving five SEA bonding agents. This study observed a marginal breakdown as early as 3 months and less than 50% had Alfa scores at the end of one year. 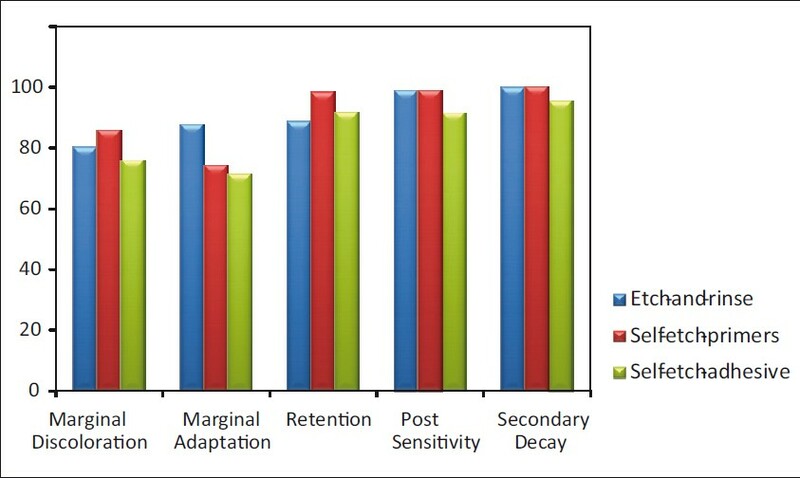 In general, failure on marginal adaptation may be caused due to thermal and mechanical stresses in the oral environment,  viscoelastic property of the restorative material,  water sorption and hydrolysis along the tooth-restorative interface  and unique stress patterns at the cervical margin of the tooth. However, this study could not reason their findings. Among the 12 SEA tested, 4 (Hybrid Bond, iBond Gluma inside, Prompt L-Pop, and PSA Dyract) did not meet the ADA specification. Both Hybrid Bond and iBond Gluma inside contain methacryloxyethyltrimellitic anhydride (4-META) as an active monomer component. SEA containing 4-META get converted to dicarboxylic 4-MET in the aqueous medium leading to a pH of 1 with a potential to etch dental hard tissue. Due to the absence of the hydrophilic bonding agent in SEA systems, following polymerization, these materials behave like semipermeable membranes leading to hydrolysis of the bond. The marginal discoloration of iBond Gluma inside was attributed to rapid hydrolysis of 4-methacryloyloxyethyl trimellitic acid- (4-MET-), which are temperature-dependent, and discoloration had appeared as early as 1 month. , SEA that contain PENTA as an acidic monomer (PSA Dyract) are known to hydrolyze overtime resulting in microleakage and compromise long-term bonding effectiveness. However, Mjor and Toffenetti  have reported that narrow gaps, crevices, ditches, and microleakage adjacent to composite restoration do not lead to secondary caries. Therefore, monitoring marginal staining is recommended to extend the longevity of restoration as well as the teeth. In terms of adhesion durability, 3-step ER is considered as the "gold standard" among all bonding systems. The problems related to SEA arise due to  (1) they are too hydrophilic and act, even after polymerization, as semipermeable membranes; (2) because of the high solvent concentration, it is impossible to obtain an adhesive resin layer of adequate thickness and void from residual solvent; (3) during solvent evaporation, the monomer/water ratio may change and subsequently result in phase separations and blistering; and (4) the acidic components of these adhesives may also adversely interact with the initiator system of the composite and so weaken the bonding complex. Enamel bevel was placed in six of the studies [Table 2]. Unground enamel surfaces with the prismless structure are contaminated with oral fluid and covered with pellicle, which might prevent bonding between the adhesive and resin,  especially the efficacy of mild SEA. Hence, the placement of enamel bevel could have enabled better etching of enamel yielding better retention rates. It must be noted that the clinical studies included for review provide short-term success rates. It would be interesting to study the long-term success rates of the same clinical studies which will enlighten on the true performance of self-etch bonding systems. In addition, the so-called self-etching systems were introduced to minimize the number of critical clinical steps involved in bonding. However, it is noted that methods to overcome the limitations of self-etching systems tend to increase the number of clinical steps. Early loss of retention may not be the main cause of clinical failure. The clinical effectiveness of SEP and SEA are comparable to ER bonding systems. The author would like to thank the Editor, Dr. Gopi Krishna for inviting to write this systematic review. The author would also like to thank all the post graduate students of the Dept. of Conservative Dentistry and Endodontics for helping in collecting the literature, in particular, Dr. Ashwin, Dr. Spoorthy and Dr. Jojo. 1. Mjor IA, Gordan VV. Failure, repair, refurbishing and longevity of restorations. Oper Dent 2002;27:528-34. 2. Mjor IA, Shen C, Eliasson ST, Richter S. Placement and replacement of restorations in general dental practice in Iceland. Oper Dent 2002;27:117-23. 3. Van Meerbeek B, Vargas S, Inoue S, Yoshida Y, Peumans M, Lambrechts P, et al. Adhesives and cements to promote preservation dentistry. Oper Dent 2001;26:S119-44. 4. Van Meerbeek B, De Munck J, Yoshida Y, Inoue S, Vargas M, Vijay P, et al. Buonocore memorial lecture. Adhesion to enamel and dentin: Current status and future challenges. Oper Dent 2003;28:215-35. 5. Abdalla AI, Davidson CL. Bonding efficiency and interfacial morphology of one-bottle adhesives to contaminated dentin surfaces. Am J Dent 1998;11:281-5. 6. Perdigao J, May KN Jr, Wilder AD Jr, Lopes M. The effect of depth of dentin demineralization on bond strengths and morphology of hybrid layer. Oper Dent 2000;25:186-94. 7. Van Meerbeek B, Yoshida Y, De Munck J, Inoue S, Vargas M, Lambrechets P, et al. Correlative morphology and clinical characterization of tooth biomaterial interaction in: Self-etch primer: Current status and its evolution. Tokyo: Proceedings of the international symposium 2001; 2001. p. 41-55. 8. Yoshida Y, Van Meerbeek B, Nakayama Y, Snauwaert J, Hellemans L, Lambrechts P, et al. Evidence of chemical bonding at biomaterial-hard tissue interfaces. J Dent Res 2000;79:709-14. 10. Lin A, Mcintyre N, Davidson R. Studies on the adhesion of glass ionomer cements to dentin. J Dent Res 1992;71:1836-41. 11. De Munck J, Peumans M, Poitevin A, Lambrechts P, Braem M, Van Meerbeek B. Durability of adhesion to tooth tissue: Methods and results. J Dent Res 2005;84:118-32. 13. American Dental Association Council on Scientific Affairs. Acceptance program guidelines: Dentin and enamel adhesive materials. Chicago: American Dental Association; 2001. p. 12. 14. Cvar JF, Ryge G. Criteria for the clinical evaluation of dental restorative materials. San Francisco: U.S. Department of Health, Education, and Welfare, Public Health Service, National Institutes of Health, Bureau of Health Manpower Education, Division of Dental Health, Dental Health Center; San Francisco: US: DHEW publication 790-244; 1971. 15. Heymann HO, Sturdevant JR, Brunson WD, Wilder AD, Sluder TB, Bayne SC. Twelve-month clinical study of dentinal adhesives in class V cervical lesions. J Am Dent Assoc 1988;116:179-83. 16. Barnes DM, Blank LW, Gingell JC, Gilner PP. A clinical evaluation of a resin-modified glass ionomer restorative material. J Am Dent Assoc 1995;126:1245-53. 17. Cvar JF, Ryge G. Reprint of criteria for the clinical evaluation of dental restorative materials. Clin Oral Invest 2005;9:215-32. 18. Hayashi M, Wilson NH. Marginal deterioration as a predictor of failure of a posterior composite. Eur J Oral Sci 2003;111:155-62. 19. Fukushima M, Setcos JC, Iwaku M. Posterior composite restoration failures in five-year clinical studies (abstract 792). J Dent Res 1992;71:204. 20. Begg C, Cho M, Eastwood S, Horton R, Moher D, Olkin I, et al. Improving the quality of reporting of randomized controlled trials. The CONSORT statement. JAMA 1996;276:637-9. 21. Altman DG, Schulz KF, Moher D, Egger M, Davidoff F, Elbourne D, et al. The Revised CONSORT Statement for Reporting Randomized Trials: Explanation and Elaboration. Ann Intern Med 2001;134:663-94. 22. De Munck J, Van Landuyt K, Peumans M, Poitevin A, Lambrechts P, Braem M, et al. A critical review of the durability of adhesion to tooth tissue: Methods and results J Dent Res 2005;84:118-32. 24. Kubo S, Kawasaki K, Yokota H, Hayashi Y. Five-year clinical evaluation of two adhesive systems in non-carious cervical lesion. J Dent. 2006;34:97-105. 25. Abdalla AI, Garcνa-Godoy F. Clinical evaluation of self-etch adhesives in Class V non-carious lesions. Am J Dent 2006;19:289-92. 26. Loguercio AD, Costenaro A, Silveira AP, Ribeiro NR, Rossi TR, Reis A. A six-month clinical study of a self-etching and an etch-and-rinse adhesive applied as recommended and after doubling the number of adhesive coats. J Adhes Dent 2006;8:255-61. 27. Burrow MF, Tyas MJ. Five-year clinical evaluation of One-Up Bond F in non-carious cervical lesions. Am J Dent 2007;20:361-4. 28. Kurokawa H, Miyazaki M, Takamizawa T, Rikuta A, Tsubota K, Uekusa S. One-year clinical evaluation of five single step adhesive systems in non-carious cervical lesions. Dent Mater J 2007;26:14-20. 29. Loguercio AD, Bittencourt DD, Baratieri LN, Reis A. A 36-month evaluation of self-etch and etch-and-rinse adhesives in noncarious cervical lesions. J Am Dent Assoc 2007;138:507-14. 30. Sugizaki J, Morigami M, Uno S, Yamada T. Clinical evaluation and interfacial morphology observation of Xeno III self-etching resin bonding and restorative system. Dent Mater J 2007;26:602-7. 31. Peumans M, De Munck J, Van Landuyt K, Lambrechts P, Van Meerbeek B. Five-year clinical effectiveness of a two-step self-etching adhesive. J Adhes Dent 2007;9:7-10. 32. van Dijken JW, Sunnegεrdh-Grφnberg K, Lindberg A.Clinical long-term retention of etch-and-rinse and self-etch adhesive systems in non-carious cervical lesions. A 13 years evaluation. Dent Mater 2007;23:1101-7. 33. Pollington S, van Noort R. A clinical evaluation of a resin composite and a compomer in non-carious Class V lesions. A 3-year follow-up. Am J Dent 2008;2:49-52. 34. Tόrkόn LS, Celik EU. Noncarious class V lesions restored with a polyacid modified resin composite and a nanocomposite: A two-year clinical trial. J Adhes Dent 2008;10:399-405. 35. van Dijken JW, Pallesen U. Long-term dentin retention of etch-and-rinse and self-etch adhesives and a resin-modified glass ionomer cement in non-carious cervical lesions. Dent Mater 2008;24:915-22. 36. Van Landuyt KL, Peumans M, Fieuws S, De Munck J, Cardoso MV, Ermis RB, et al. A randomized controlled clinical trial of a HEMA-free all-in-one adhesive in non-carious cervical lesions at 1 year. J Dent 2008;36:847-55. 37. Ritter AV, Heymann HO, Swift EJ Jr, Sturdevant JR, Wilder AD Jr. Clinical evaluation of an all-in-one adhesive in non-carious cervical lesions with different degrees of dentin sclerosis. Oper Dent 2008;33:370-8. 38. Kubo S, Yokota H, Yokota H, Hayashi Y. Two-year clinical evaluation of one-step self-etch systems in non-carious cervical lesions. J Dent 2009;37:149-55. 39. Reis A, Loguercio AD. A 36-month clinical evaluation of ethanol/water and acetone-based etch-and-rinse adhesives in non-carious cervical lesions. Oper Dent 2009;34:384-91. 40. Reis A, Leite TM, Matte K, Michels R, Amaral RC, Geraldeli S, et al. Improving clinical retention of one-step self-etching adhesive systems with an additional hydrophobic adhesive layer. J Am Dent Assoc 2009;140:877-85. 41. 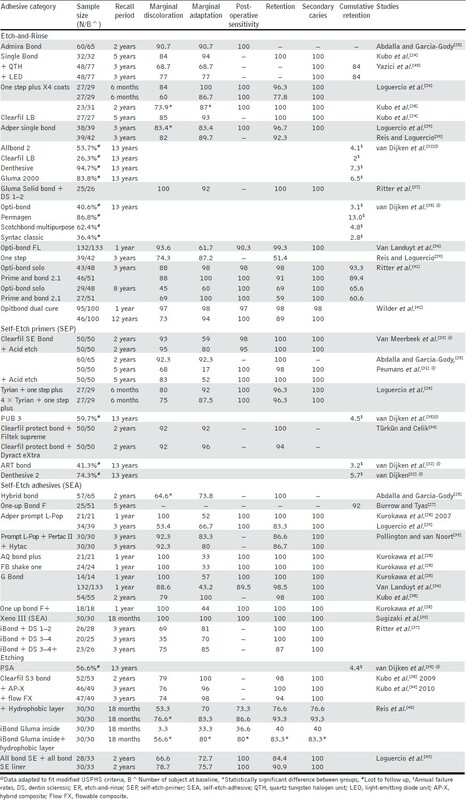 Ritter AV, Swift Jr EJ, Heymann HO, Sturdevant JR, Wilder AD Jr. An eight-year clinical evaluation of filled and unfilled one-bottle dental adhesives. J Am Dent Assoc 2009;140:28-37. 43. Loguercio AD, Mβnica D, Ferneda F, Zander-Grande C, Amaral R, Stanislawczuk R, et al. A randomized clinical evaluation of a one- and two-step self-etch adhesive over 24 months. Oper Dent 2010;35:265-72. 44. Kubo S, Yokota H, Yokota H, Hayashi Y. Three-year clinical evaluation of a flowable and a hybrid resin composite in non-carious cervical lesions. J Dent 2010;38:191-200. 45. Yazici AR, Celik C, Ozgόnaltay G, Dayangaη B. The effects of different light-curing units on the clinical performance of nanofilled composite resin restorations in non-carious cervical lesions: 3-year follow-up. J Adhes Dent 2010;12:231-6. 46. Heintze SD. Systematic reviews. I. Correlation between laboratory tests on marginal quality and bond strength. II. The correlation between marginal quality and clinical outcome. J Adhes Dent 2007;9:77-106. 47. Hickel R, Roulte JF, Bayne S, Heintze SD, Mjor IA, Peters M, et al. Recommendations for conduction controlled clinical trials of dental restorative materials. Clin Oral Investig 2007;11:5-33. 48. Van Meerbeek B, Perdiaga˜o J, Lambrechts P, Vanherle G. The clinical performance of adhesives. J Dent 1998;26:1-20. 49. Bayne SC, Heymann HO, Sturdevant JR, Wilder AD, Sluder TB. Contributing co-variables in clinical trials. Am J Dent 1991;4:247-50. 50. Roberson TM, Heymann HO, Swift EJ. Sturdevants' art and science of operative Dentistry. St Louis: Mosby:2006 p. 527-66. 51. Rueggeberg FA, Margeson DH. The effect of oxygen inhibition on an unfilled/filled composite system. J Dent Res 1990;69:1652-8. 52. Loguercio AD, Loeblein F, Cherobin T, Ogliari F, Piva E, Reis A. Effect of solvent removal on adhesive properties of simplified etch-and-rinse systems and on bond strengths to dry and wet dentin. J Adhes Dent 2009;11:213-9. 53. Pashley EL, Agee KA, Pashley DH, Tay FR. Effects of one vs two applications of unfilled, all-in-one adhesive on dentin bonding. J Dent 2002;30:83-90. 54. Sidhu SK, Carrick TE, McCabe JF. Temperature mediated coefficient of dimensional change of dental tooth-colored restorative materials. Dent Mater 2004;20:435-40. 55. Watanawongpitak N, Yoshikawa T, Burrow MF, Tagami J. the effect of bonding system and composite type on marginal adaptation of different C factor restoration. Dental Material J 2006;25:45-50. 56. McCabe JF, Rusby S. Water sorption, dimensional change and radial pressure in resin matrix dental restorative material. Biomaterials 2004;25:4001-7. 58. Frankenberger R, Tay FR. Self-etch vs etch-and-rinse adhesives: Effect of thermomechanical fatigue loading on marginal qulity of bonded resin restorations. Dent Mater 2005;21:397-412. 59. Perdigγo J, Dutra-Corrκa M, Castilhos N, Carmo AR, Anauate-Netto C, Cordeiro HJ, et al. One-year clinical performance of self-etch adhesives in posterior restorations. Am J Dent 2007;20:125-33. 60. Perdigγo J, Dutra-Corrκa M, Anauate-Netto C, Castilhos N, Carmo AR, Lewgoy HR, et al. Two-year clinical evaluation of self-etching adhesives in posterior restorations. J Adhes Dent 2009;11:149-59. 61. Yoshida Y, Nagakane K, Fukuda R, Nakayama Y, Okazaki M, Shintani H, et al. Comparative study on adhesive performance of functional monomers. J Dent Res 2004;83:454-8. 62. Mjor IA, Toffenetti F. Secondary Caries: A literature review with case reports. Quintessence Int 2000;31:165-79. 63. Kanemura N, Sano H, Tagami J. Tensile bond strength and SEM evaluation of ground and intact surface. J Dent 1999;27:523-30. 64. Tay FR, Pashley DH, King NM, Carvalho RM, Lai SC, Marquenzini Jr L. Aggressiveness of self etch adhesives on unground enamel. Oper Dent 2004;29:309-16. 65. Misra DN. Adsorption of 4-Methacryloxyethyl trimallitate anhydrite (4-META) on hydroxyapatite and its role in composite bonding. J Dent Res 1989;68:42-7. 66. Kemp-Schlote CM, Davidson CL. Marginal integrity related to bond strength and strain capacity of composite resin restorative system. J Prosthet Dent 1990;64:658-64. 67. Perdigγo J, Lopes M, Geraldeli S, Lopes GC, Garcia-Godoy F. Effect of a sodium hypochlorite gel on dentin bonding. Dent Mater 2000;16:311-23. 68. Hashimoto M, Sano H, Yoshida E, Hori M, Kaga M, Oguchi H, et al. Effects of multiple adhesive coatings on dentin bonding. Oper Dent 2004;29:416-23. 69. Choi KK, Condon JR, Ferracane JL. The effects of adhesive thickness on polymerization contraction stress of composite. J Dent Res 2000;79:812-7. 70. Koike T, Hasegawa T, Itoh K, Yukitani W, Yamashita T, Wakumoto S, et al. Effect of multiple application of a dentin adhesive on contraction gap width of a resin-based composite. Am J Dent 2002;15:159-63.